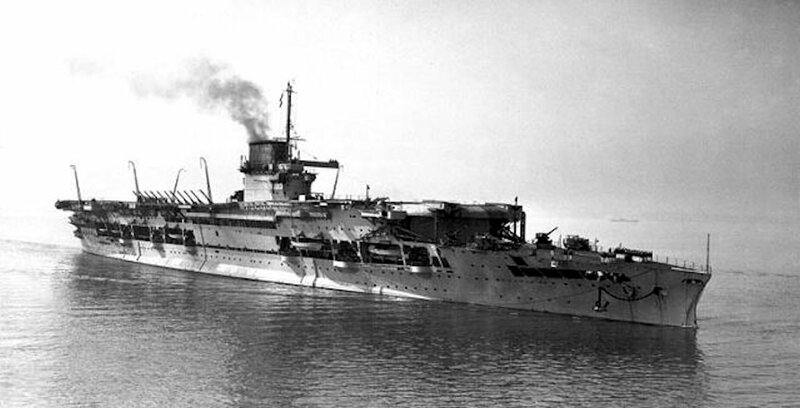 Badham, Arthur George, 28th November 1943, Royal Navy, H.M.S. 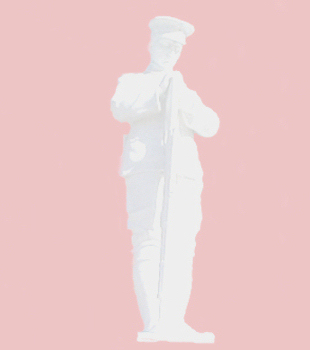 Birmingham, P/JX 219986, Able Seaman, Son of John Henry and Beatrice Mary Badham; husband of Louisa May Badham, PORTSMOUTH NAVAL MEMORIAL, Panel 73, Column 3. 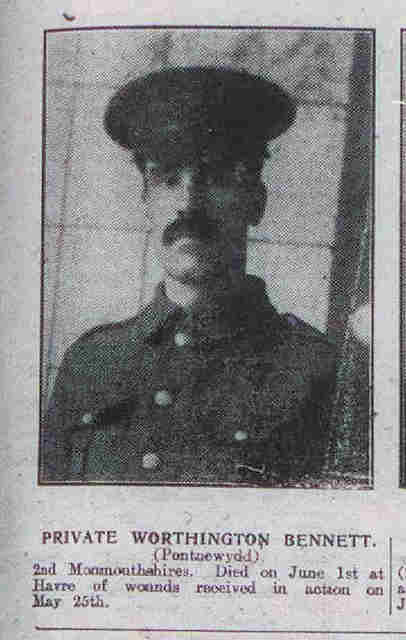 Bates, Albert, 25th May 1915, 1st Bn. Welsh Regiment, 36064, Private, YPRES (MENIN GATE) MEMORIAL, Panel 37. Bennett, Worthington W, 35, 1st June 1915, 2nd Bn. Monmouthshire Regiment, 3030, Private, Son of Worthington and Caroline Bennett; husband of E. M. Bennett, of 3, Albany Terrace, Soundwell Rd., Staple Hill, Bristol, STE. MARIE CEMETERY, LE HAVRE, Div. 19. D. 9. Berrow, W S, 17th February 1919, 1st Bn. Monmouthshire Regiment, 230195, PONTHIR BAPTIST CHAPEL YARD, Left of main path close to road. 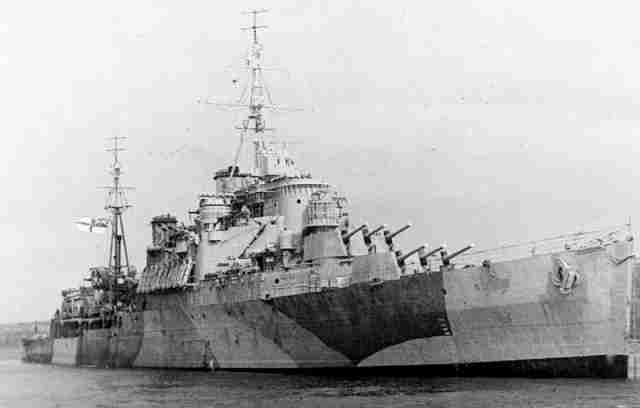 Berry, Alfred Jack, 31, 8th June 1940, Royal Navy, H.M.S. 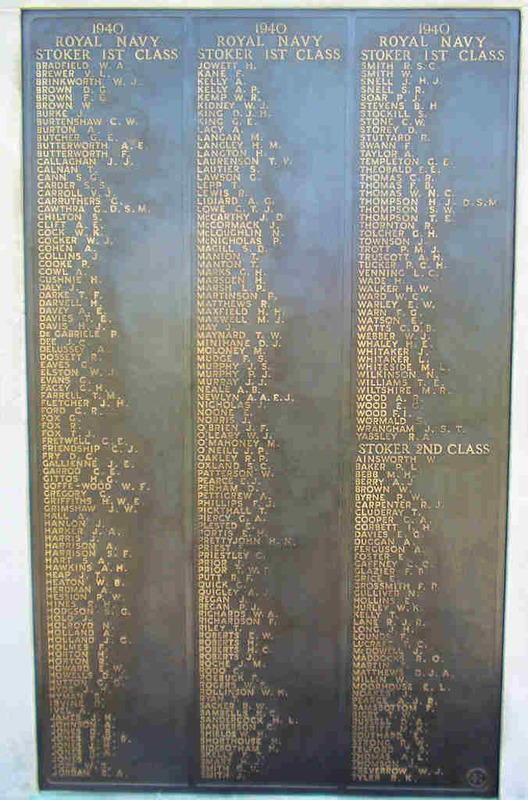 Glorious, D/KX 101078, Stoker 2nd Class, Son of Albert Henry and Cathrine Berry, of Pontnewydd, Monmouthshire, PLYMOUTH NAVAL MEMORIAL, Panel 41, Column 3. 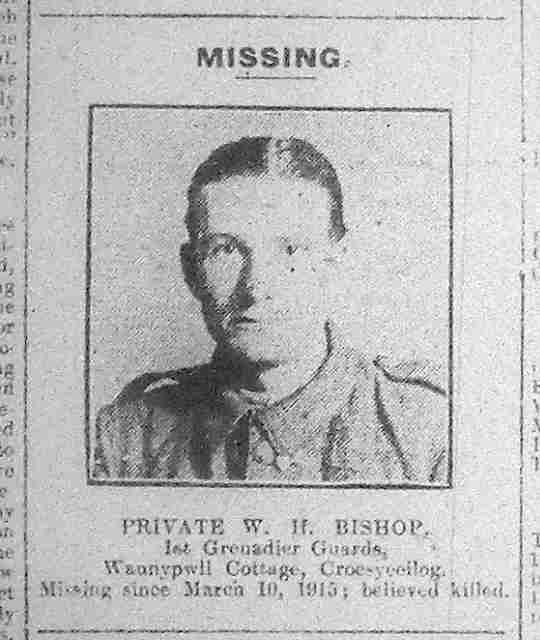 Bishop, William Henry, 10th March 1915, 1st Bn. Grenadier Guards, 15838, Private, LE TOURET MEMORIAL, Panel 2. Birden, Ivor, 26, 20th March 1944, 1/4th Bn. Essex Regiment, 4080212, Private, Son of George and Harriet Birden, CASSINO MEMORIAL, Panel 8. Bonsey, Robert Albert, 25, 24th September 1944, 1st Wing Glider Pilot Regiment, A.A.C., 5387698, Serjeant, Son of Robert Harold and Minnie Bonsey; husband of Iris Patricia Bonsey, of Cwmbran, Monmouthshire., ARNHEM OOSTERBEEK WAR CEMETERY, 23. A. 10. Bosworth, Arthur Richard, 19, 8th May 1915, "B" Coy. 1st Bn. Monmouthshire Regiment, 1277, Lance Corporal, Son of Annie Agnes Passant (formerly Bosworth), of 39, The Highway, Croesycelliog, Newport, Mon., and the late Charles Bosworth, YPRES (MENIN GATE) MEMORIAL, Panel 50. 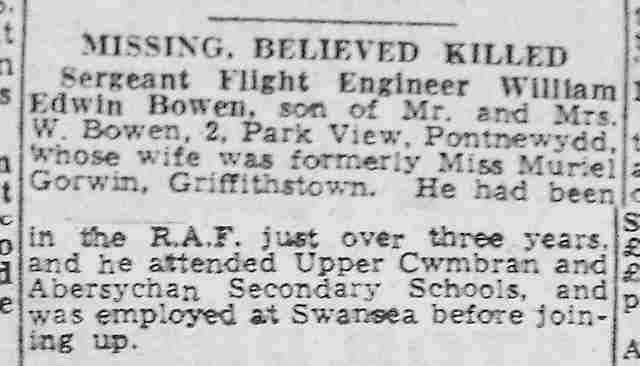 Bowen, William Edwin, 32, 27th November 1943, Royal Air Force Volunteer Reserve, 1118317, Sergeant, Son of William and Raechal Mary Bowen; husband of Muriel Adene Bowen, of Cockett, Glamorgan, RUNNYMEDE MEMORIAL, Panel 143. 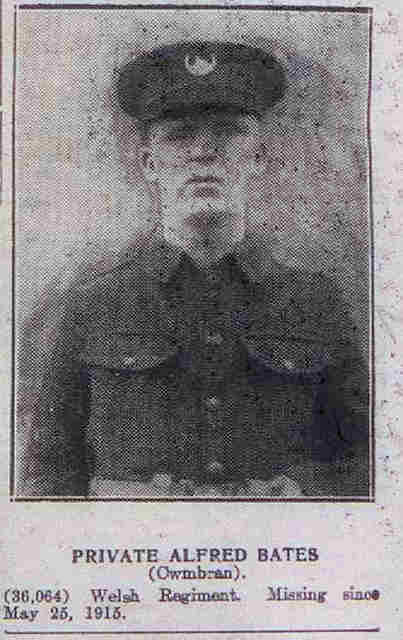 Bowles, Clifford, 19, 16th May 1915, 1st Bn. Royal Welsh Fusiliers, 5094, Private, Son of Emanuel and Beatrice Bowles, of 3, Avon Terrace, Pontnewydd, Newport, Mon., LE TOURET MEMORIAL, Panel 13 and 14. 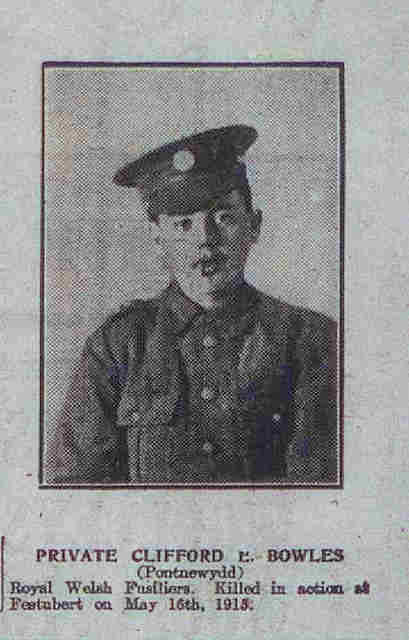 Brain, George Henry, 19, 4th December 1916, 1st Bn. South Wales Borderers, 26122, Private, Son of William and Elizabeth Brain, of "Penderis" Woodland Rd., Lower Pontnewydd, Newport, Mon., ALBERT COMMUNAL CEMETERY EXTENSION, I. R. 45. Brinkworth, William John, 35, 28th April 1918, "D" Coy. 10th Bn. South Wales Borderers, 23259, Corporal, Son of George F. and Annette M. Brinkworth, of 123, Oakfield Rd., Cwmbran, Mon., BOULOGNE EASTERN CEMETERY, IX. A. 46. Bumstead, Arthur Leopold, 23, 28th March 1918, 2nd Bn. Machine Gun Corps (Infantry), 10256, Private, Son of C.B. and E.H. Bumstead, of Hillside, Llantarnam, Newport, Monmouthshire, ACHEUX BRITISH CEMETERY, Plot 1. Row B. Grave 23. Burchell, Frank Henry, 21st February 1944, attd. 4th Bn. Oxford and Bucks Light Infantry, Somerset Light Infantry, 14387874, Private, CWMBRAN CEMETERY, Sec. C. Row 7. Grave 39. Burke, John Clifford, 19, 10th November 1942, Royal Navy, H.M.S. Martin, C/SSX 35132, Ordinary Signalman, Son of John and Phoebe Burke, of Pontrhydyrun, Monmouthshire, CHATHAM NAVAL MEMORIAL, 58, 3. 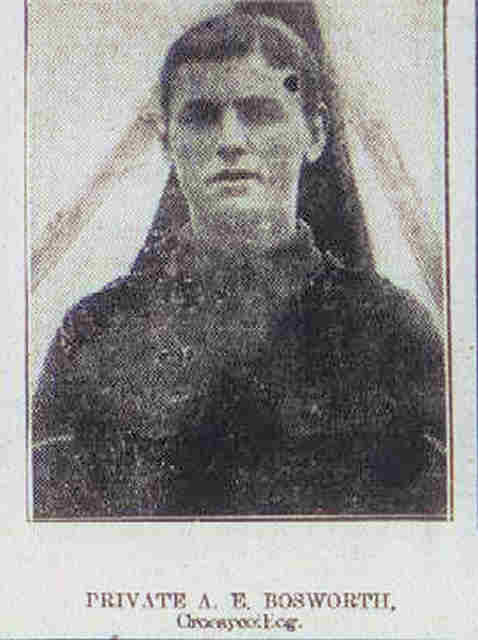 Butcher, J, 26th July 1916, 2nd Bn. Monmouthshire Regiment, 1936, Serjeant, Husband of E. Butcher, of 22, Woodside Rd., Cwmbran, Newport, Mon., COUIN BRITISH CEMETERY, II. B. 3.